At The Hide House, the Milwaukee Art Beat street fair played silence between sets anticipating Fever Marlene . An old warehouse towered over everyone. Deep in the background next to the parking lot where mini-festivities took place, a few canopies stood on the lawn. The clothes rack I spotted could have been holding old towels, but my funky t-shirt intuition honed in without fail. 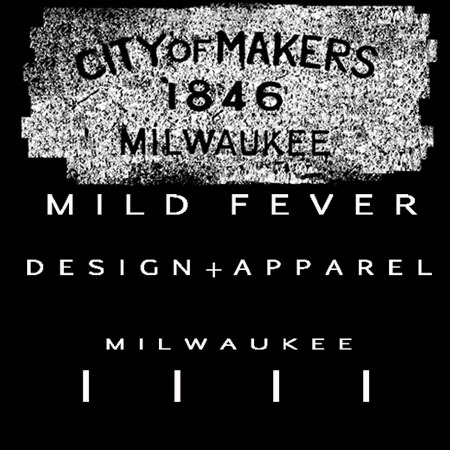 Whipping through the garments, I notice the iconic Wisconsin map outlined and, spelled with various syllable combinations, a cursive script printing the letters M-i-l / w-a-u / k-e-e / A-l-t. One item keeps my eye but I leave it on the hanger. Other merch sits on the table, buttons, stickers if I recall. Noticeable photo prints come into view, I inquire and Suzy perks nonchalantly. A full-time free-lance photographer, Suzy’s Milwaukee Alt puts a brand on his work, however at its core Milwaukee Alt provides a concept for his image compositions. Photographically capturing scenery of Milwaukee and adorning it with models of less mainstream urban style tribes, Milwaukee Alt brings social fringes into the fashion foreground. Ryan “Suzy” Laessig founded Milwaukee Alt to create a port-hole for vicariously experiencing deviant sub-popular culture. Recently, publishing his first book of photography entitled Milwaukee Alt to hardcover, Suzy crusades brandishing images that counter stayed culture. Milwaukee Alt incarnates his artistic style, self-defined as Elegantly Anarchistic. Shades of glamour, vintage pin-up, fetish and erotica bleed through Suzy’s pieces in a tasteful way. Suzy achieves balance with his ability to even make statements with mundane moments framed in still. Thoughtfully, Suzy adds to the growing fashion tradition that interprets beauty as something imperfect, forbidden and taboo. Over the past decade this aesthetic crept into high-end fashion, part of the spectrum of “edgy”. Admittedly Suzy Laessig’s work tends a little towards risqué, so consider fair forewarning given before clicking to Milwaukee Alt. After checking out Fever Marlene for a bit, I see the last of the artists breaking down their displays and that damn clothing rack still stands there. Fumbling through the last of my paper pocket change, I make a snap decision to go check on the t-shirt I was eying earlier. It’s still there. The Art Beat marked Suzy’s first public display and publishing of the Milwaukee Alt photo book, and he’s at least one re-purposed clothing piece lighter. Laessig’s is currently working on deals to make the published version of Milwaukee Alt available at Sky High and Hot Pop. The Milwaukee Alt book is current available through it’s Facebook page.